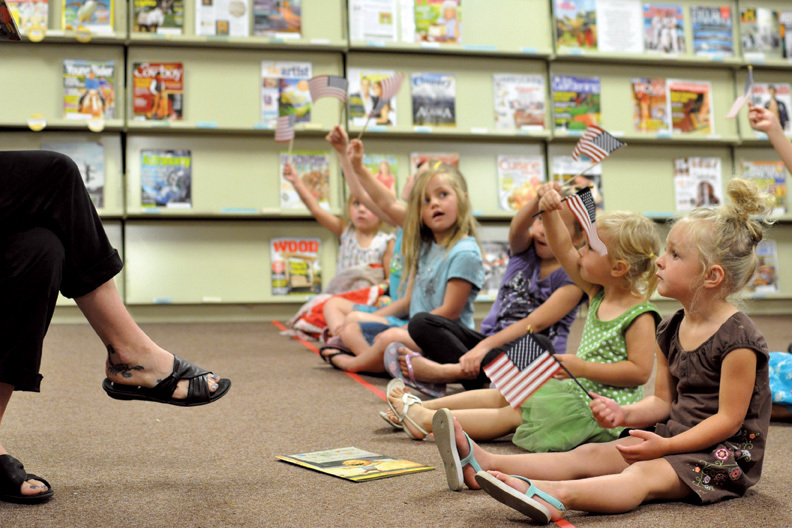 Meadow Simpson, 3, right, waves a flag with other children during a Independence Day-themed story-time Thursday at the Craig branch of the Moffat County Libraries. The weekly event is part of the library’s summer reading program, which offers reading incentives for children, teens and adults. The Craig branch of the Moffat County Libraries kicked off Independence Day festivities a little early this year. The miniature parade capped off a weekly summer story-time with a Fourth of July flair, complete with a read-aloud of children’s books commemorating the holiday. Story-time, along with other activities during the library’s summer reading program, are part of a larger effort to keep students turning pages when school is out. Children who don’t read during the summer are prone to “the summer slide,” or a gradual academic loss, said Christy Gonzales, Moffat County Libraries programs coordinator. The summer reading program is a “fun way to keep that from happening,” she said. The program is free and offers prizes for children, teens and adults. It includes a children’s story-time at 11 a.m. every Thursday through Aug. 16. After that date, regular story-time hours resume at 10 and 11:30 a.m. every Thursday. Story-time is a popular event for young readers. “We normally have a pretty good crowd in attendance,” Gonzales said. The library’s summer program ties in with statewide efforts to get Coloradans reading. Lt. Gov. Joe Garcia and the Colorado State Library issued a challenge to encourage state residents to collectively read 2.75 million pages this summer, or 1.25 million more pages than logged in summer 2011. Gonzales believes the challenge is a reason to read in itself. “That’s kind of been an incentive, when you have the whole state working on a common goal,” she said. Robert Hammond, Colorado commissioner of education, unveiled another project to tie in with Garcia’s initiative, which launched in February. “Find a Book, Colorado,” offers a free online resource bank for parents, teachers and students to track down books that challenge them and pique their interest. For more information about “Find a Book, Colorado,” visit http://www.lexile.com/findabook. Registration is still open for the Moffat County Libraries’ reading program. For more information or to sign up, call the Craig branch at 824-5116, visit the library at 570 Green St., or visit http://www.moffat.lib.co.us.